Shadow Nation is alive with music and passion as it follows a group of renowned rock musicians led by George Lynch (Dokken/Lynch Mob) on a journey through Native American reservations in the southwest and the Great Plains. Forging new friendships, they learn about the many injustices done to Native Americans and how those seeds of repression have contributed to the poverty, alcoholism, and illnesses that continue to plague the reservations. The film features the thoughts and opinions of people like philosopher Noam Chomsky, activists and musicians Tom Morello and Serj Tankian, and even political lighting rod Ted Nugent. As manifest destiny unfolded a couple of centuries ago, a critical opportunity of merging two cultures was lost. 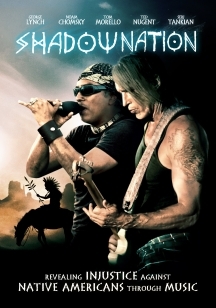 Shadow Nation reveals the vacuous nature of our modern worldview, a philosophy of unrestrained materialism that's disconnected from the natural world.